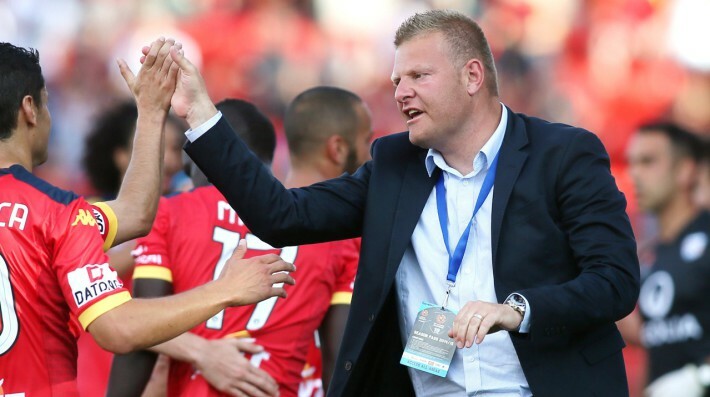 Adelaide United have already beaten Sydney FC three times at Allianz Stadium this season and Reds coach Josep Gombau is adamant they have a key advantage to make it four in a row in next Saturday’s semi-final. The Reds’ remarkable record at Moore Park saw them knock Sydney out of the FFA Cup with a 3-1 extra-time victory in October, followed by a 3-0 hammering of the Sky Blues on Boxing Day and rounding out with a 1-0 win in early April. The closest Sydney have come to a win over Adelaide came in November, when they drew 0-0 at Hindmarsh Stadium. Now Gombau believes the Reds are at a distinct advantage yet again following their last-gasp 2-1 elimination final win over Brisbane at Adelaide Oval on Friday night, saying the match will make them sharper than the Sky Blues. “If I am honest, it’s better to play than to stay a week off without playing because you keep the speed of the game, you keep this feeling,” he said. “I think we have a little bit of an advantage in this – that they stopped and they don’t play the game. “If we played on Wednesday, I would say no. But we play on Saturday. We have eight days [so] we can recover perfect. Adelaide have won five their past seven over Sydney, with two draws, indicating the Sky Blues’ difficulty in breaking down the possession-based style employed by Gombau. Still, Gombau admits that past history won’t count for much when the two sides go at each other in front of a crowd that Sydney FC chief executive Tony Pignata expects to be between 25,000-30,000, which may make it the most attended match of the entire finals series. “These are numbers. Yesterday we were here and everybody said, ‘The last three games, Brisbane’ [have beaten Adelaide],” Gombau said. When asked if he “feared” the form of the Sky Blues, Gombau appeared anything but fazed by how well Graham Arnold’s team were going. “I am not worried, because this is a team that plays in the same league as us and I think that while we are playing away, it will be a good environment in Sydney,” he said. Gombau should be able to call on Bruce Djite for the match in his home city after the injured striker was given an extra week to overcame a groin strain. Argentinian playmaker Marcelo Carrusca will also be monitored after being replaced in the second half as he struggled to keep up with the pace of the match. He was replaced by Awer Mabil, who scored the match-winner. Another change may come in the form of Michael Marrone, free to play after serving his one-game suspension, with Dylan McGowan potentially making way after making a dreadful error that gifted Thomas Broich Brisbane’s first-half equaliser. “Now we need to think about the Sydney game, the way we play, the style we play, whether we play with three or play with four at the back, and we’ll see what can be more useful for us,” Gombau said. © 2015 The Age | This article was written by Sebastian Hassett and first appeared in The Age on 2 May 2015.